in Class II (Group B). These Jobs are temporary and likely to be permanent. Total available vacancies are 87 As per requirement of OPSC, total available Jobs are 87. Application mode is Online. Opening date to send Online Application forms is 20th June, 2018. Closing date to send Online Application forms is 19th July, 2018. Closing date for payment of Application fee is 19th July, 2018. 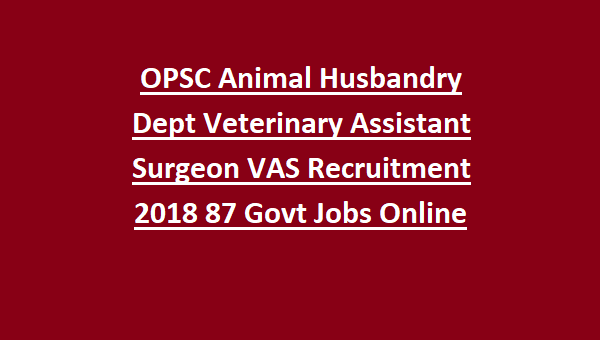 All details of OPSC Animal Husbandry Veterinary Assistant Surgeon Govt Jobs Recruitment 2018 details are mentioned below. As per requirement of OPSC, total available vacancies are 364. Candidate's age Limit should be under 32 years and over 21 years as on 01st January, 2018. Educational Qualification for Candidates should be Bachelors degree in the discipline of Animal Husbandry and Veterinary Science from a recognized university. Pay scale must be Rs.9300/- to Rs.34800/- per month with Grade Pay of Rs.4600/-. 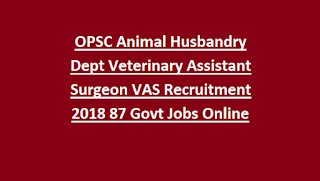 Selection for these Veterinary Doctors recruitment will be through written test and personal interview. 1. No fee for SC, ST, PWD category candidates; Rs.300/- for all remaining candidates. 2. Closing date for payment of Application fee is 19th July, 2018. Odisha Public Service Commission (OPSC) requires Online Application forms through proforma to be made available on Official Website of http://opsconline.gov.in. Closing date to send Online Application forms is 19th June, 2018. Take print out of Online Application form and send it to below Address. Closing date for submit hard copy of Application form is 30th November, 2017. Cuttack PIN - 753 001.